This native Texan singer/songwriter started writing songs and playing guitar at an early age. A former collegiate and Professional Rodeo Cowboy Association member, Mack learned early on the value and advantages of being an independent thinker and writer. His ability to write songs and pick songs from other writers that people can relate to in everyday life is quite evident in the albums that Mack has recorded and in his stage show. Under the guidance of Hall of Fame steel guitar player, Tom Brumley (long-time member of Buck Owens and the Buckaroos), Mack went to Nashville to record the “Different Situations” album with producer, Vic Clay. Not afraid of going against the grain, Mack picked Floyd Tillman’s “Slippin’ Around” as the first release off the album, which landed on the Billboard Chart. To show versatility, the second release from the album was the title cut, “Different Situations”, a very upbeat song. The “Different Situations” video won the Lone Star Award at the Houston International Film Festival, and received airplay on The Nashville Network and CMT. This song featured Nashville guitar guru, Ray Flack (some pickers are still trying to figure out those licks!). The result was another Billboard Chart song and a 5-country, 55-city tour of Europe. When Mack says that he has ridden his tour bus all over the world, he is telling the truth as the Bandag Corporation, sponsor of the tour, shipped his tour bus overseas for this tour. Upon returning stateside, Mack played many various venues, from The Farm Bureau Convention in California to political conferences in Indianapolis, Willie Nelson’s Fourth of July Picnic, and the Super Bull in Del Rio, Texas. Mack’s writing ability was recognized by the Wholesale Beer Distributors Association of Texas when their executive director came to him and requested a song to be written to persuade members of the Texas Legislature against creating a new tax on beer. Mack then wrote, “Don’t Tax My Beer”, a tongue-in-cheek song whose message that the working people did not need another tax, was written about in the Wall Street Journal. In the spring of 2008, Willie Nelson’s XM Satellite Radio Station, Willie’s Place, picked up on Mack’s latest album, “Fire on the Line”. You can hear a couple of cuts just about every day on XM Channel 13/Sirius Channel 64. Always wanting to be mobile and have the ability to take his live show outdoors anywhere, Mack had the idea to make a semi rig that would transform into a large outdoor stage, complete with sound and lights. Mack and long-time friend, Texas singer/songwriter, Kenny Zink, convinced Mack’s wife Jessie to help them build this rig. This rig has been used at various venues from Texas Motor Speedway to many outdoor festivals, including Mack’s Mason County Country Music Festival in Mason, Texas. 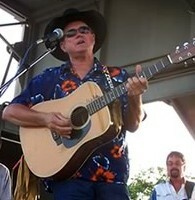 On July 3, 2008, Mack and his band performed on Mack’s mobile stage at Willie Nelson’s Grand Opening at Carl’s Corner, Texas along with Willie, Darrell McCall, Leona Williams, and a host of other great country acts. This mobile rig can be seen at www.prizmstaging.com. Mack has always had a top notched country band as evidenced by some of his former players, such as Texas fiddler Bobby Flores, Tom Brumley, and Brett Beavers (Nashville producer of acts such as Dierks Bentley). His current band is comprised of Bob Arnold-lead guitar and vocals, Chip Steele-bass guitar and vocals, Kevin Carter-drums, Will Brumley-fiddle, mandolin, and vocals, Robert Bridges-keyboard, Scott Jenkins-steel guitar, and Richard Lednicky-sound engineer. Mack Abernathy’s music has always been received well in country radio. Jerry King, former Program Director and current radio personality at KKYX in San Antonio, had this to say: “Mack Abernathy is the kind of singer and songwriter that country music is all about”. Bill Kinder, KSCS-Dallas radio personality, says, “Mack has talent and a down home attitude that relates to his listeners on a personal basis.” Mack has combined his singing and song-writing talents to create a country style that is all his own and one that his fans really enjoy and repeatedly want to hear. Download Mack Abernathy's stage plot.